At this time in internet history, e-government is evolving to offer information, help, and efficiencies of all sorts to citizens. Measuring citizen participation in e-government and evaluating its success and shortcomings so far can help point the way toward improved online services and to a more satisfied, and therefore involved, engaged citizenry. This research was designed as a lens into this e-government moment in time. The report focuses on people’s problems that fall within the realm of government administration or concern. It examines how people seek to deal with these kinds of problems and solve these kinds of matters. In particular, it compares and contrasts the different ways (internet versus more traditional ways) people approach the government for the help they need. A majority of Americans (58%) have contacted their government in some way during the past year. The methods for contacting the government varied. Some 42% of those who contacted the government say they visited an agency in person; about one in three (29%) say they called a government office; 18% say they sent an email to a government office or agency; and 13% say they wrote a letter to the government. Americans reached out to different layers of government administration. Some 27% of those who say they contacted the government in the past year say they contacted their local government; another 27% say they contacted their state government. Slightly fewer – 23% – say they contacted the federal government. And 12% say they reached out to several different levels of government. About 10% of respondents either could not remember or would not say where they approached the government. Members of minority groups are less likely to have contacted the government than others. Three in five white Americans (60%) say they have contacted their government in the past year, while 49% of minority adults have done the same. Internet users are much more likely to contact the government than non-users, whether or not they actually used the internet to make that contact. Two-thirds of internet users (65%) say they have contacted the government in the past year, compared with 36% of those who do not use the internet. Internet users double non-users in contacting the government offline as well. There are no certain causes in our data that explain this finding. Perhaps internet users, who are more highly educated than non-users, feel more confident using their research or problem-solving skills, or perhaps they are inclined to use multiple approaches in trying to accomplish their mission. A similar pattern emerges when comparing high-access and low-access users. Two-thirds of high-access internet users (66%) say they have contacted the government in the past year, compared with 43% of those who have only dial-up access at home or no personal internet access. Many now expect the government to offer information and services online. Most Americans expect their government to make information and services available online. Seven in ten (70%) say they expect to be able to get information or services from the government agency website when they need it. Only 23% do not expect that. Not surprisingly, this expectation is heavily related to people’s exposure to the internet, which is, in turn, closely related to age. For example, 80% of internet users expect the government websites to provide what they need, compared with only 41% of those who do not use the internet. 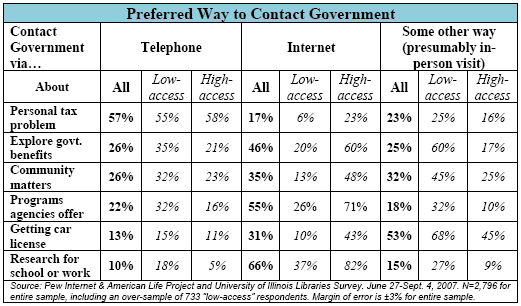 Even those with only dial-up access to the internet at home (part of the low-access group) expect good government websites: 76% say the websites should provide the information and assistance they need. Nearly four in five members of Gen X and Gen Y (age 18-42 years) expect government websites to be this useful. Only 40% of those age 65 years and over do so. 78% of internet users have visited government websites. Nearly four in five internet users (78%) have visited government websites to seek information or assistance. They most commonly visit a local, state or federal government website: a total of 71% have done this, including 66% in the past year. About two in five (38%) have gone online to research official government documents or statistics, including 35% who have done it in the past year. About one in four (24%) have gone online to get advice or information from a government agency about a health or safety problem and 22% have gone online to get information about, or apply for, government benefits. How would Americans like to contact their government? Given the many ways that Americans get in touch with their government, it is no surprise they have a range of opinions about the best way to do so in the future. Two in five Americans (40%) say they would prefer to get a government document or publication from the internet, compared with 31% who would prefer it be sent via the mail. One in five (19%) would prefer to collect the document from a government office and 6% say they would go to the local public library. Low-access users are much less likely to prefer the internet, perhaps because of slow download speeds on dial-up connections. Only 15% of low-access users prefer to get documents from the internet, while 46% would like the document by mail, 25% from the government office, and 8% at the library. Americans seem to choose their methods for contacting the government on a case-by-case basis. In dealing with the government on a personal tax problem, 57% of adults will use the telephone, while only 17% will use the internet. In exploring government benefits for yourself or someone else, only 26% use the telephone and 46% use the internet. For getting a license or permit for a car, 13% use the telephone, 31% use the internet, and 53% choose some other way, probably because such transactions involved often require in-person appearances, often with documentation. Even among those with no reported contact with their government in the past year, there is increasing awareness of various means to deal with the government. Forty-six percent now say they are aware that the government has set up 800-numbers and websites to provide help to the general public, an increase over the 38% found in a July 2003 Pew Internet Project survey.